In all, 373 out of 503 voting members of Congress who have official Facebook pages posted about the attack at least once during the period studied. The analysis only examined Facebook posts that included text written from a member’s account; posts with only an image, for instance, were excluded. 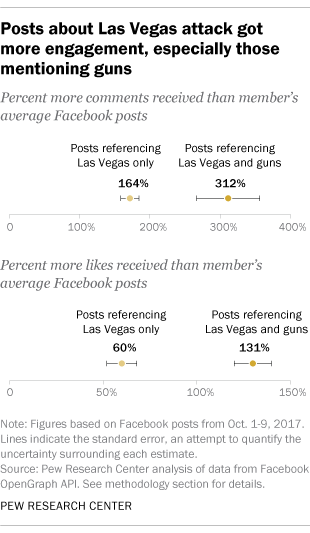 Members’ posts also generated more engagement – such as “likes” and comments – from Facebook users when they mentioned both guns and the Las Vegas attack, as opposed to just the attack. Posts mentioning both drew an average of 131% more likes and 312% more comments when compared with the number of likes and comments each member normally gets for a post. Posts about the attack with no reference to guns, by comparison, drew 60% more likes and 164% more comments, on average, than the average number of likes and comments a post by that member normally receives. Democrats and Republicans in Congress who posted about the attack also used different language to describe it. Democrats were more than twice as likely as Republicans to describe the event as a “shooting” (as opposed to “last night’s events,” for example), a difference of 80% to 35%. 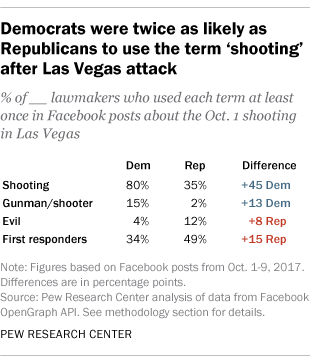 Republicans were more likely to spotlight “first responders” – 49% of Republicans who posted about the attack use that phrase, compared with 34% of Democrats. Republicans were also more likely to describe the attacker or his intentions as “evil” – 12% of them used this term (22 members total), compared with 4% of Democrats (8 total). Democrats, however, were more likely to use the term “gunman” or “shooter,” with 15% doing so (30 total), versus 2% of Republicans (4 total). While these percentages might seem low in the context of other findings, they are noteworthy for word frequencies, because rather than choosing from a limited number of answers – as with a survey question – legislators could draw on their entire vocabularies for their statements. As a result, it is notable that even a small share of legislators used identical words. The Center’s analysis also examined posts based on members’ ideology – based on DW-NOMINATE, a measure based on legislative voting records – but it did not find substantial differences in responses to the attack between more or less conservative Republicans or more or less conservative Democrats. Facebook is often used as a way for legislators to connect with their core supporters, but it’s important to note that legislators who do not discuss gun policy on the platform still may do so on other platforms – or may ultimately take positions on gun-related measures without addressing them on Facebook. A June report by Pew Research Center highlighted Americans’ complex relationship with guns. The survey found that nearly three-quarters of U.S. gun owners (74%) say the right to own a gun is essential to their own sense of freedom. At the same time, substantial majorities of Americans support proposals to limit access to firearms, such as requiring background checks for guns purchased privately and at gun shows. Note: The methodology behind this analysis can be found here (PDF). This post was updated on Oct. 20, 2017, to clarify that there were 181 Facebook posts that mentioned both the Las Vegas shooting and guns during the period examined. 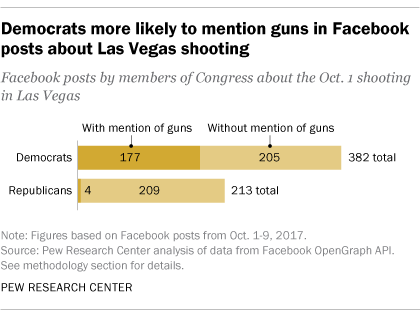 In addition, the chart “Democrats more likely to mention guns in Facebook posts about Las Vegas shooting” was updated to more accurately depict figures shown. Dennis Quinn is a research fellow focusing on data science at Pew Research Center.